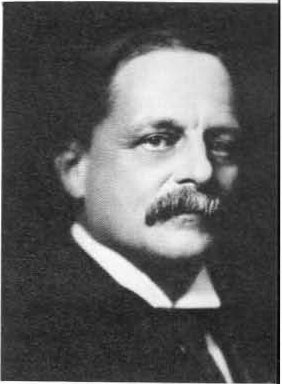 Elihu Thomson, AIEE President, 1889 - 1890, his invention of the 3 coil dynamo was the foundation to a successful electric lighting system that he and colleague E. J. Houston produced in 1879 through their company Thomson-Houston Electric Company. This company merged with Edison General Electric Company in 1892 to form General Electric Company. Elihu Thomson was born in Manchester, England, on 29 March 1853. His family moved to the United States in 1858, settling in Philadelphia, where he graduated from the Central High School early in 1870. He entered a laboratory as analyst, but was appointed assistant professor of chemistry at Central High School later in the same year. In 1876, when twenty-three years old, he was given the Chair of Chemistry in the same school. This position was retained until 1880, when, having become deeply interested in the future applications of electricity, he resigned to devote his entire time to electrical research. Thomson's unusual inventive genius and marked ability to learn quickly were apparent even during his early years. His first important invention was the 3-coil arc dynamo, which, with its automatic regulator and other novel features, was the basis of the successful electric lighting system produced by the company that Thomson and a former high-school colleague, E. J. Houston, established in Philadelphia in 1879: the Thomson-Houston Electric Company. In 1892 the company merged with the Edison General Electric Company to become the General Electric Company. In the early years of the new company Thomson was elected chief engineer, producing many of the fundamental inventions upon which General Electric was based. Thomson received about 600 patents in the United States alone, many of the inventions used widely in lighting, railways, power transmission, etc. Thomson's electric meter, as an example, which received first prize in a meter competition in Paris in 1890, was made by the millions. His discoveries and inventions in alternating currents are well known. He was also the inventor of the electric air drill, and pioneered also in high frequency electricity, upon which some wireless telegraphy techniques were based. He was the originator of the method of electric welding by resistance, a process applied extensively to metal manufactures. Thomson was the first recipient of the Edison Medal, bestowed upon him in 1909 "For meritorious achievement in electrical science, engineering and arts as exemplified in his contributions thereto during the past thirty years." Thomson was quite active in the American Institute of Electrical Engineers (AIEE), serving at various times as committeeman, and as vice president and president. He was president of the member of the Institution of Civil Engineers, London; Fellow of the American Academy of Arts and Sciences, Boston; member of American Philosophical Society, of the American Physical Society, Chemical Society and the National Academy of Science; and of many other societies in the United States and abroad. He was the recipient of many awards and honors. In 1889 he was decorated by the French Government for his electrical inventions, being made Chevalier et Officier de la Legion D'Honneur. He received the honorary degree of A.M. from Yale (1890). Tufts College in 1892 gave him the degree of Ph.D., and in 1899 he received a D.Sc. from Harvard. He was awarded the Rumford Medal in 1901, the Grind Prix at the Paris Expositions of 1899 and 1900, the Hughes Medal by the Royal Society of Great Britain for Experimental Researches in Electricity in 1916, and the John Fritz Medal also in 1916. He was president of the Massachusetts Institute of Technology from 1920 to 1923. Thomson was married twice, first to Mary Louise Peck, in 1884. They had four children. After she died in 1916, he married Clarissa Hovey. He died at his home in Swampscott, Massachusetts, on 13 March 1937. This page was last edited on 14 February 2019, at 20:30.